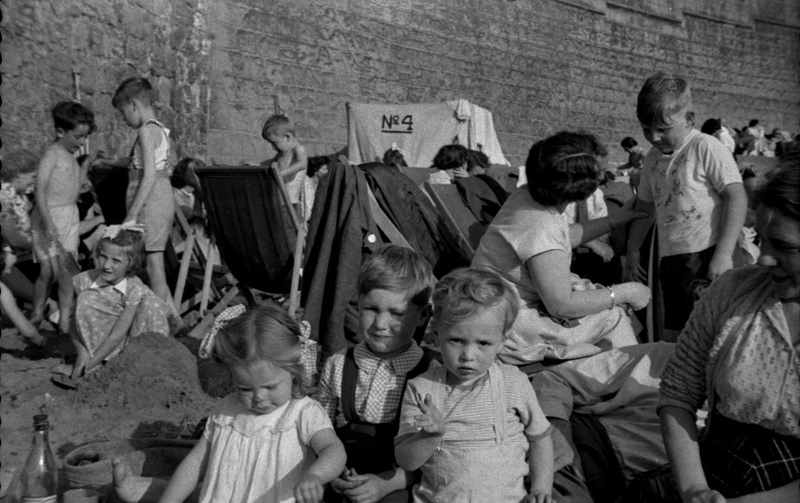 A couple of years ago I came across a collection of negatives at my Mum’s house in Hartlepool. I scanned them recently using an Epson V370 flatbed / negative scanner, and some of the resulting images are shown here. 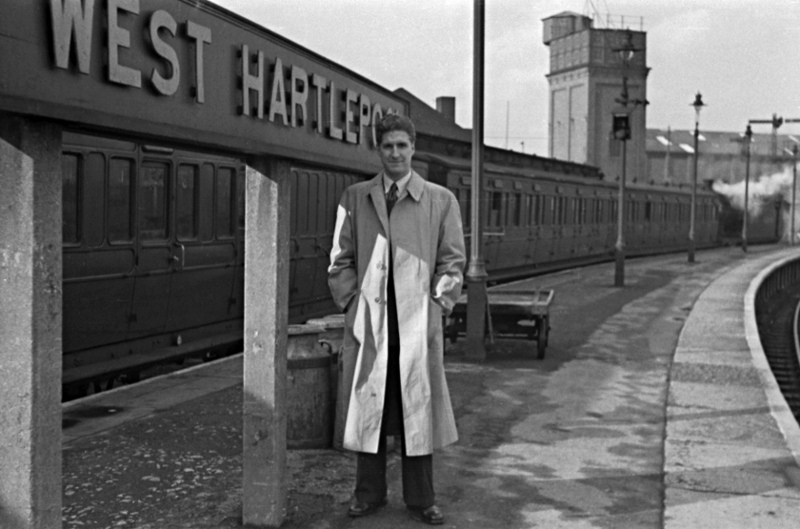 My Dad at West Hartlepool Railway Station, October 1949. My grandfather William Leonard, with my brother Bill and cousin Kay in the back. I never knew him. He died a few years before I was born. 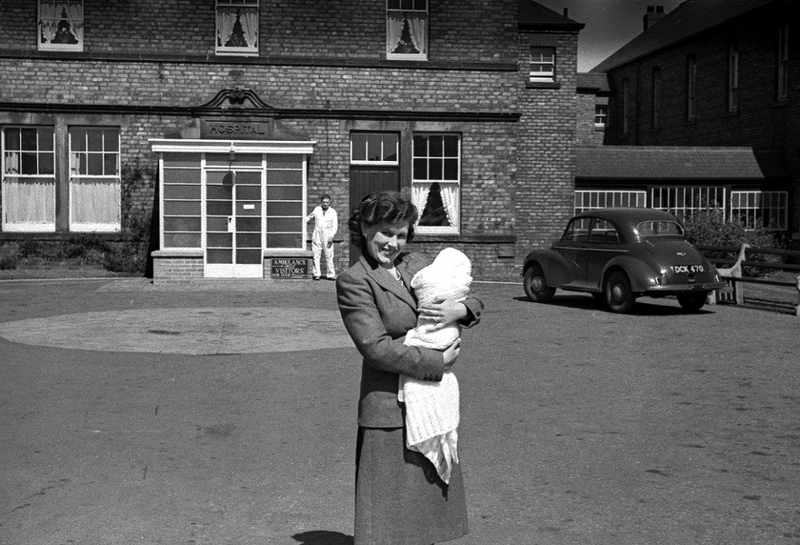 My Mum leaves hospital with the first of her three sons, April 1950. She was 22. 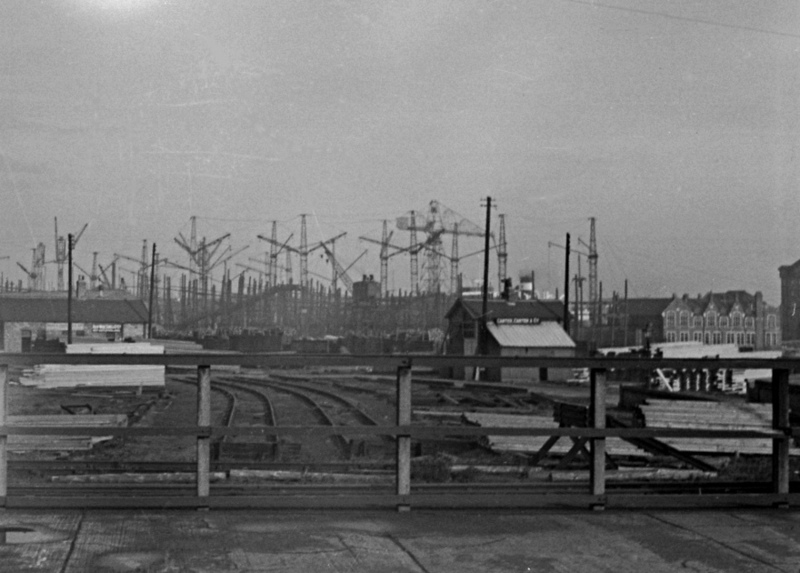 Taken from the west end of West Hartlepool Railway Station, looking toward the docks, in 1949. The prominent structures are shipbuilding cranes. The last ship to be built here left 12 years later in 1961. 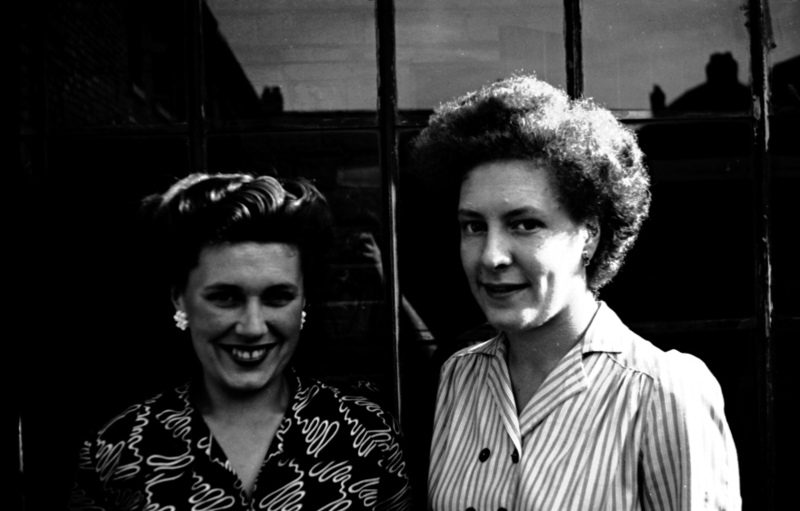 My Mum and my Aunty Alwyn. 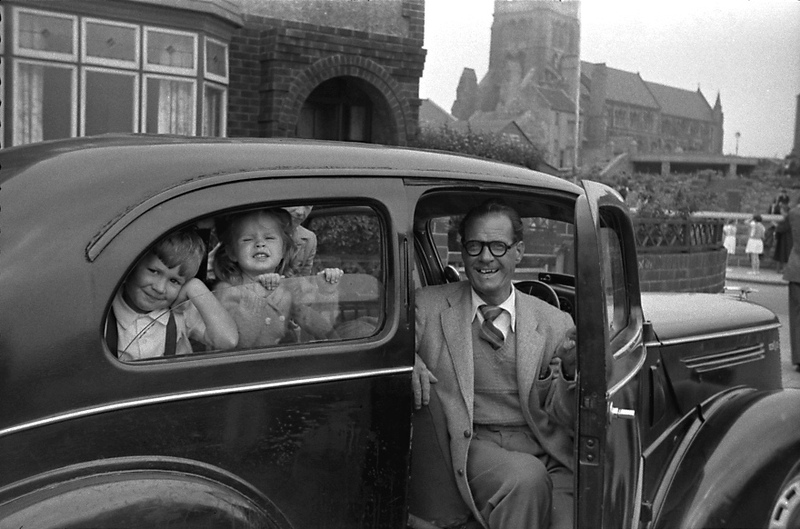 Sadly Alwyn died in 1970, about twenty years after this photo was taken. 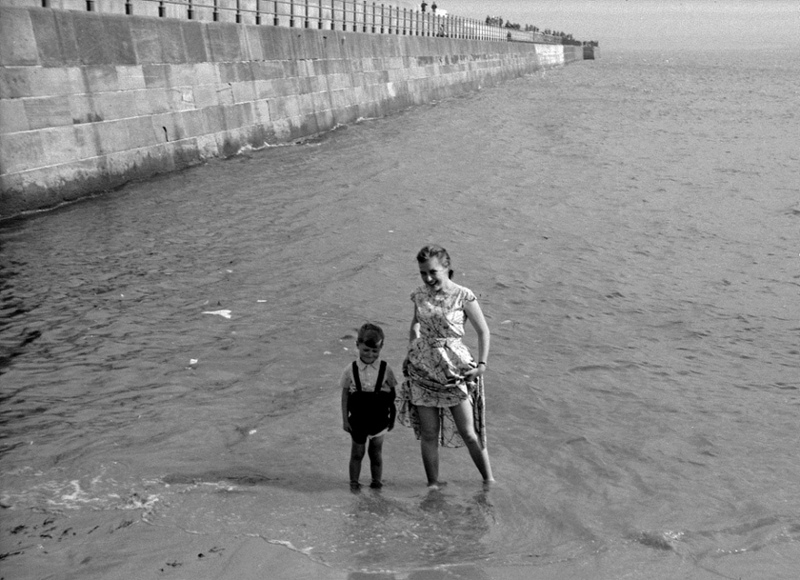 Bill and Aunty Kay at the Fish Sands, Hartlepool. The pier on the left had been damaged in heavy storms that year, but had been repaired by the time this photo was taken. Bill at the beach with my cousin Katie and my Mum’s cousin, David Craig. Same day, I think. Southwark Bridge, with Cannon Street Station in the background. I think those are trams on the bridge, so this must have been taken before 1952. The station looks very different today; the train shed roof was removed in 1958, but the distinctive towers to each side remain. 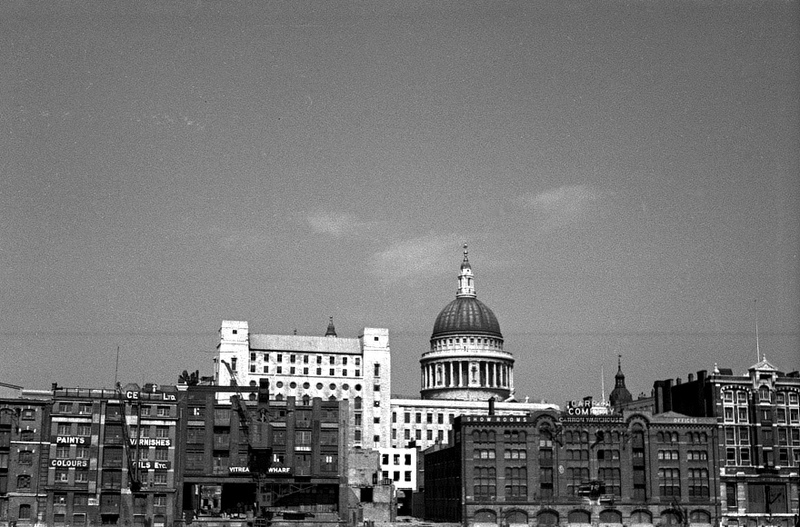 A view of St Paul’s from the river. All of the buildings in the foreground at the water’s edge have gone now. The tall building to the left is the Faraday Building, on Queen Victoria St.
From the same boat trip as the previous two photographs, a view of the Tower of London. 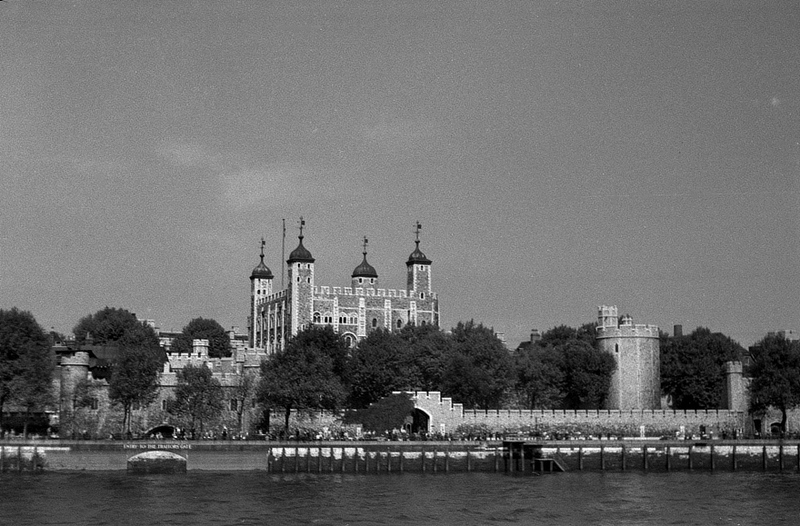 It looks much the same today, except that the prominent trees directly in front of the Tower are no longer to be seen. 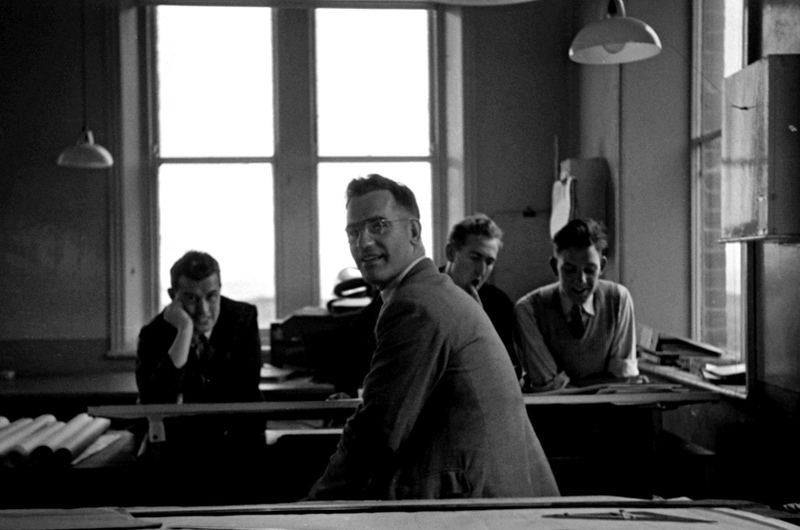 Are you related to Valentine Gibbon, who worked for British Transport Docks Board? I worked in the offices, and never forgot such an unusual name…I think he was a Dockgateman. 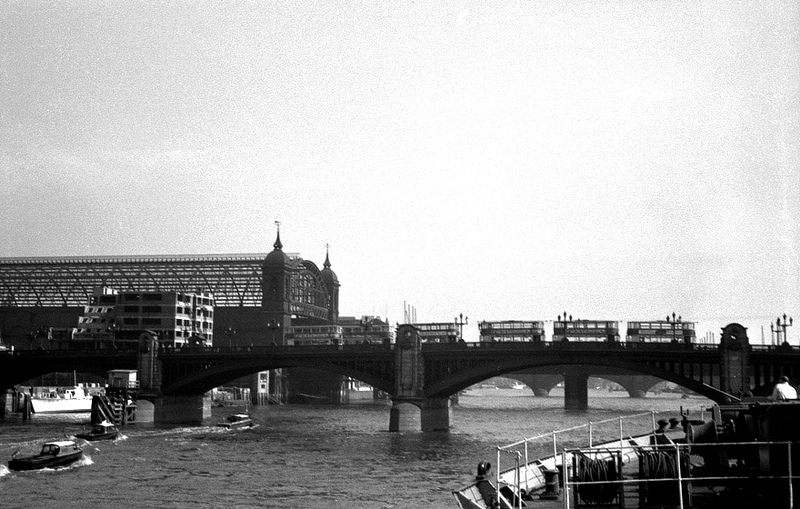 Yes, those are trams on Southwark Bridge. They used to turn there since they were prohibited in the City and the West End.. One was the 46 to Woolwich, which was the very last service to run in 1952. Can I ask you a couple of questions about your photos, as you have said that William Leonard was your grandfather (I thought he owned the furniture store), is your mam Eileen, and did she have a brother also called William Leonard (but everyone called him bill) and his daughter would be the little girl who you have as your cousin Katie, and she has a brother and sister called Billy and Patricia. 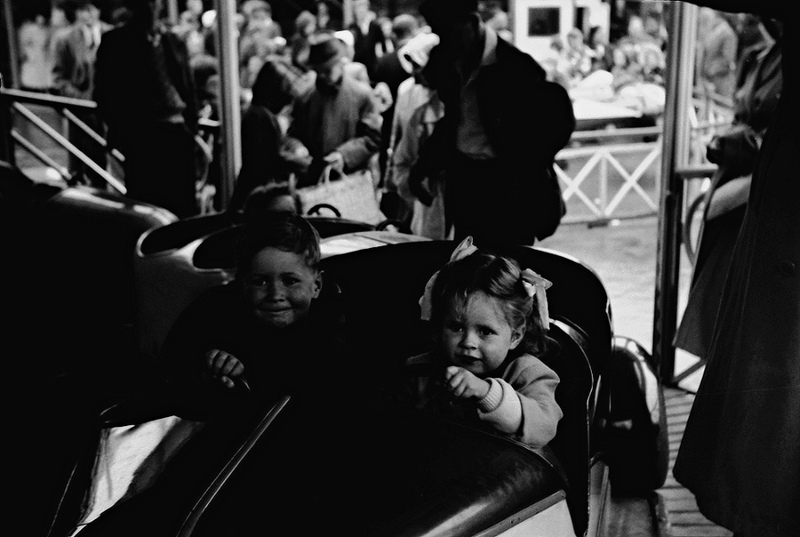 As I think that the little girl is my Mam and if so could I possibly have a copy of any of the prints that she is in. I will email you about this. However, yes it sounds like we are relatives! 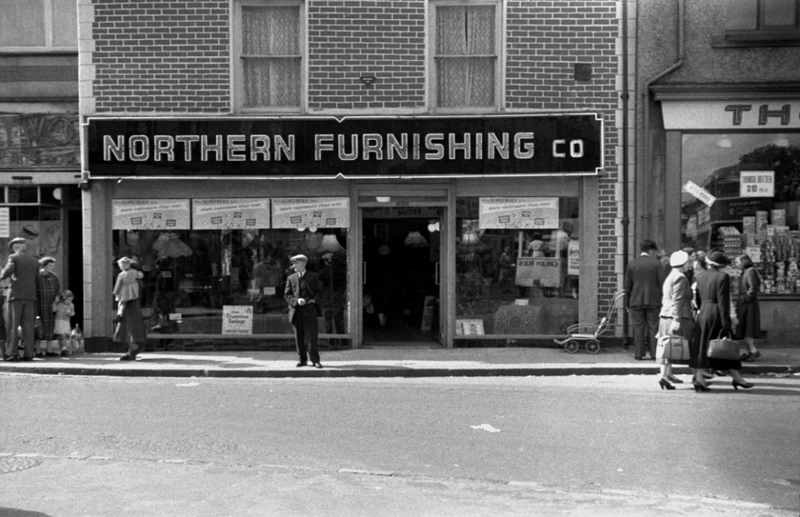 My husband and I are busy making a film about the regeneration of Bishop Auckland (see Bishop Auckland Documentary Project page on Facebook) and we would love to include the photo of the furniture shop if you would give us permission please? It would go in the section about the changing face of business in the town. You don’t by any chance have any more of Bishop do you?? This is a volunteer project with all proceeds going to Butterwick Hospice in Bishop. Just in the process of browsing Facebook and came across you! 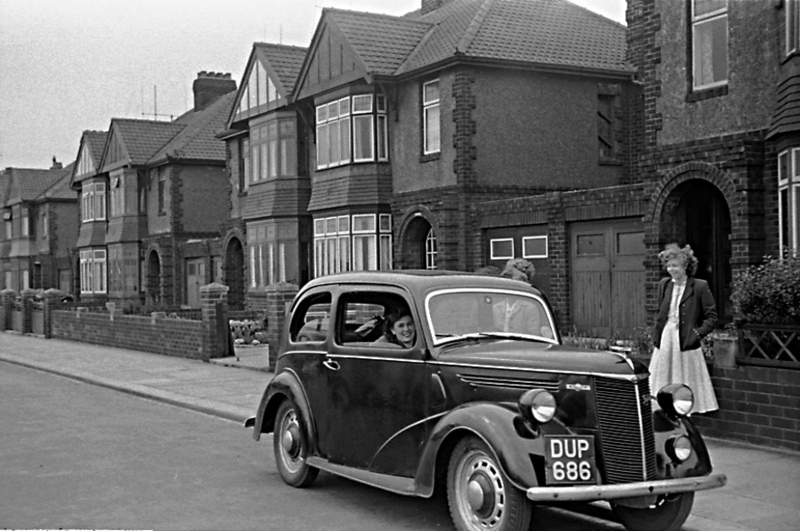 Great photos, love social history and especially anything to do with Hartlepool. Sometimes see your Mum when I attend the odd quiz night at the Bowls Club. Like you I continue to follow the Canadian Trio that is ‘Rush’ and consider myself an avid fan as well. I have to thank you – as it was you that introduced me to them way back in the 70s when me and Eric listened to extracts from All The World A Stage in your lounge. Seen every British tour since Farewell to Kings. Happy memories. I was gutted the 40th Anniversary tour failed to hit European shores and hope that they might get together to record some new material. Mark, very nice to hear from you! I’m so sorry I didn’t see your comment earlier, I don’t check the comments as often as I should. Hope the years have been kind to you. Those early Rush UK tours seem a very long time ago now.